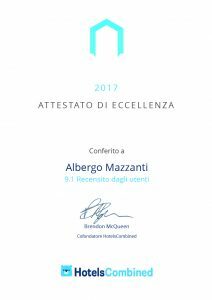 HotelsCombined has recognized the Albergo Mazzanti as one of the best accommodation facilities for customer satisfaction in 2017. The hotels have been evaluated based on more than 260 million reviews and opinions written by customers. Being in this group of excellence means representing the highest quality standards in the hospitality industry. Albergo Mazzanti have recived 177 reviews and and an overall rating of 9.1 out of 10. This incredible result projects Albergo Mazzanti at the top of the ranking in the Verona area. – the absence of unresolved serious problems/complications reported by several customers in prolonged periods of time. – the way in which the staff of the structure responds to the “Certificate of Excellence” team, demonstrating their commitment to providing prompt assistence.